The Canberra Citizen of the Year Award recognises citizens who have made a major contribution to the community. The award is significant - it recognises the efforts of individuals in the community and also helps to promote a sense of civic pride. The award was first introduced in 1989, continuing a tradition started by The Canberra Times some years prior to self government. The Award is presented by the Chief Minister in March each year as part of Canberra's birthday celebrations. 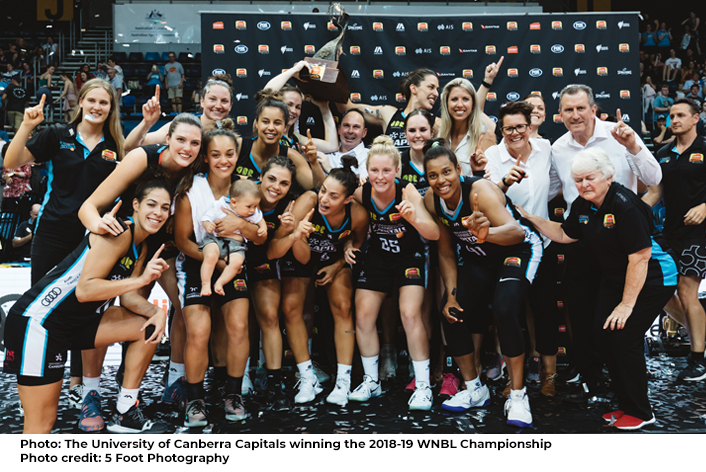 In recognition of the exceptional teamwork and spirit displayed by the University of Canberra Capitals as well as their community of supporters who spurred them on to victory as the 2018-19 WNBL champions. This club’s efforts are an inspiration for all Canberrans, and the players are great role models for young people in our community. The Canberra Citizen of the Year can be an individual or a group who make an outstanding contribution to our community without expectation of remuneration or reward. They are motivated to act for the good of the community and are a participating member of the Canberra community. They contribute to the advancement of Canberra and our community. They make an outstanding contribution across any endeavour, including, but not limited to, the areas of education, business, health, charity, the arts, the environment, disability, youth, research, medicine or the media. Strong regard will be given to a nominee's achievements in the year immediately prior to nomination, however ongoing and sustained contribution will also be considered highly. Past achievements should also be included in the nomination. Nominees can be based in Canberra or the Canberra region, as long as the impact of their contribution is primarily within the ACT. Previous Canberra Citizens of the Year.